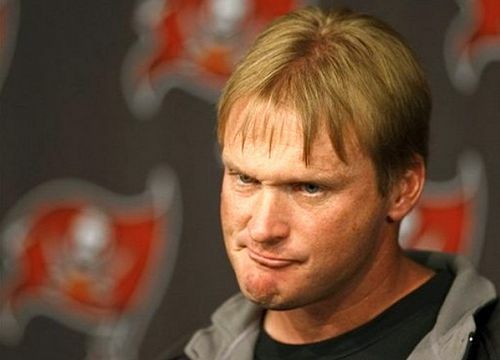 We woke up this morning to the “report” that Jon Gruden will be the next football coach at the University of Tennessee, thanks in part to Cleveland Browns owner – and UT supporter – James Haslam. According to WREG in Memphis, Gruden has a “contract offer in hand” from the Volunteers and the deal is sweetened by an offer – which reportedly would not past muster with the both the NCAA and the NFL – from Haslam for an ownership stake in the Browns. Our first reaction to all this was if Tennessee wants Gruden – and at least one poll shows he is the favorite of 53 percent of UT fans – then go for it. Whatever it takes to keep him as far away as possible from the sidelines at Cleveland Browns Stadium is fine by us (come to think of it, Knoxville may not be far enough away). Gruden was 95-81 in 11 years as an NFL, won more than nine games only once in his last six years in the league and has a reputation for developing quarterbacks despite never actually developing a quarterback. The media likes him because he talks loud and fills their notebooks, but that doesn’t mean anyone should want him near the Browns. What does worry us, if any of this is even remotely true, is how it reflects on Haslam’s thinking. If he would be willing to go to such great lengths to bring an average coach to his beloved UT, what will his thought process be when the time comes to make a decision on the next coach of the Browns? If he thinks Gruden is good, there’s no telling who he would want to bring to Cleveland. Which is a thought even more scary than Chucky himself. Good news on the injury front for the Browns, as quarterback Brandon Weeden has been cleared to play on Sunday against Oakland. Weeden suffered a concussion against Pittsburgh when he hit his head on Joe Thomas’ leg while being sacked. “It was mild,” Weeden said. “I never got knocked out. I was conscious the whole time, was just a little foggy. The league’s taking this thing pretty seriously, so you’ve got to go through the mandated steps. I passed all those, so I’m ready to rock and roll. Weeden didn’t have his best game of the year against the Steelers – and he’s been struggling for a few weeks now – but he did get the Browns into the end zone twice against the NFL’s No. 1 ranked defense and he gives the Browns their best chance of actually walking away on Sunday with a winning streak and their first road win in more than a year.